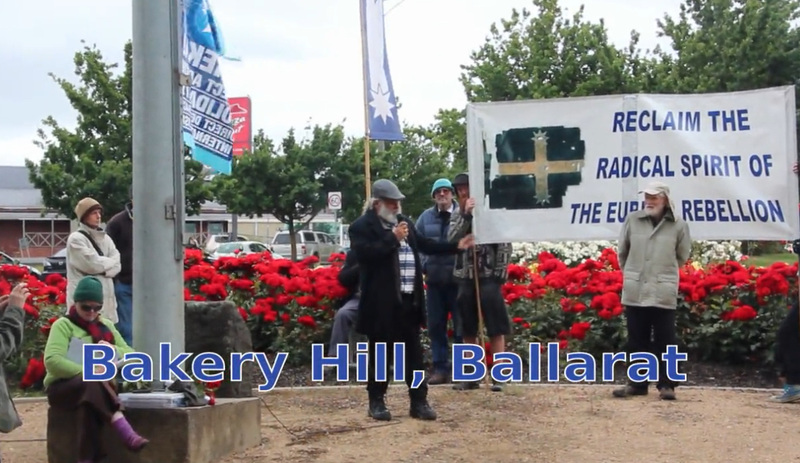 It was with some horror as people approached Bakery Hill on December 3 and saw the tattered and torn Eureka flag flying from the flagpole in the middle of the roundabout. Surely City of Ballarat Council pays attention to the state of iconic symbols for the city? Perhaps not. 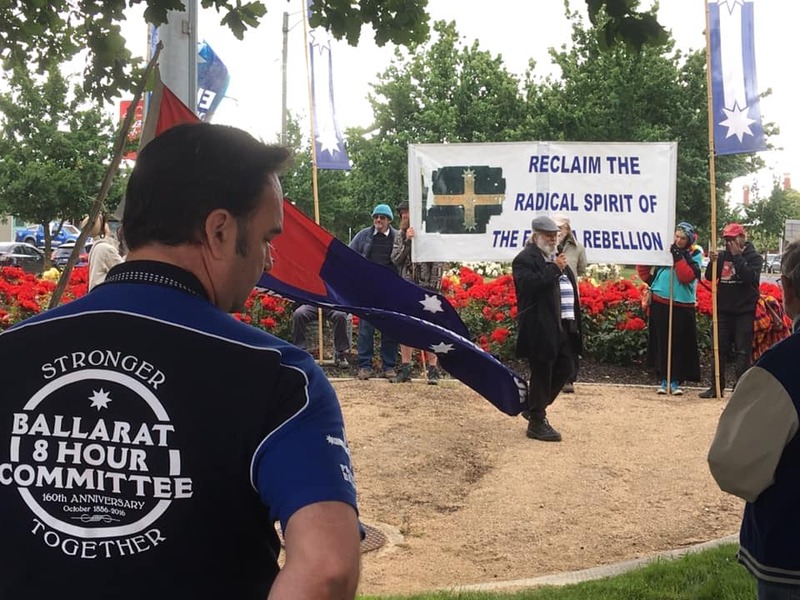 Joe Toscano lambasted the Council for it’s lack of attention to the state of this Eureka Flag in his comments before starting the Eureka Australia Medal award ceremonies. The NUW delegate team from the Woolworths Hume Distribution Centre were awarded a Eureka Australia Medal for their union campaign for a new Enterprise Bargaining Agreement. Great speech by activist Sam Castro in accepting a Eureka Australia Medal award in highlighting the role of women at Eureka, and the ongoing need for gender equality and smash Patriarchy. WACA’s Sam Castro was honoured with a Eureka Australia Medal, and used the opportunity to speak to the ongoing oppressions faced by women and non-binary people both within peace and social justice movements and in our broader society. She called on the good men present to step forward and stand with us to defend OUR rights and liberty. One of the interesting historical facts concerning Bakery Hill is that the Builders Labourers Federation, lead at the time by Norm Gallagher, put a green ban on this site in 1977 to stop the development of a McDonalds restaurant directly on the site. Back in Melbourne after spending December 3, the anniversary of Eureka in Ballarat. Important to commemorate the anniversary of this event which was an important origin of democracy in Australia. 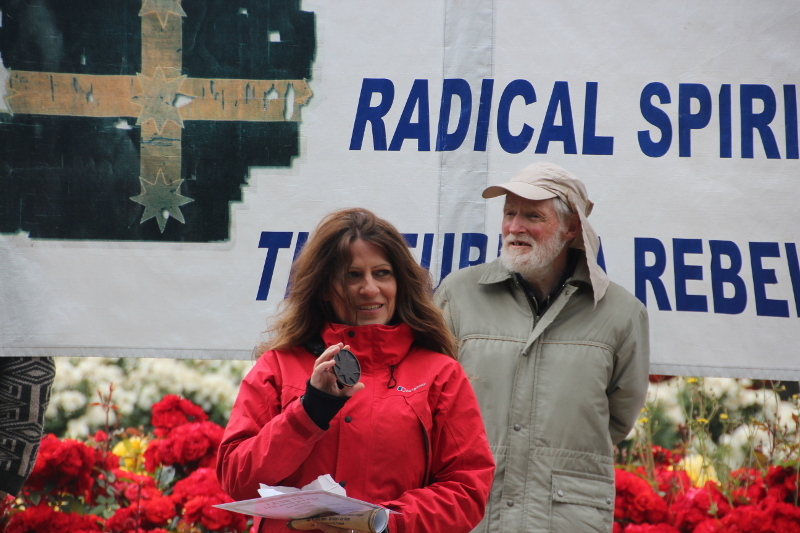 This anniversary commemorative event started in 2002 after Joseph Toscano and partner Ellen Jose visited Ballarat in 2001 and found there were no official events organised for the anniversary. 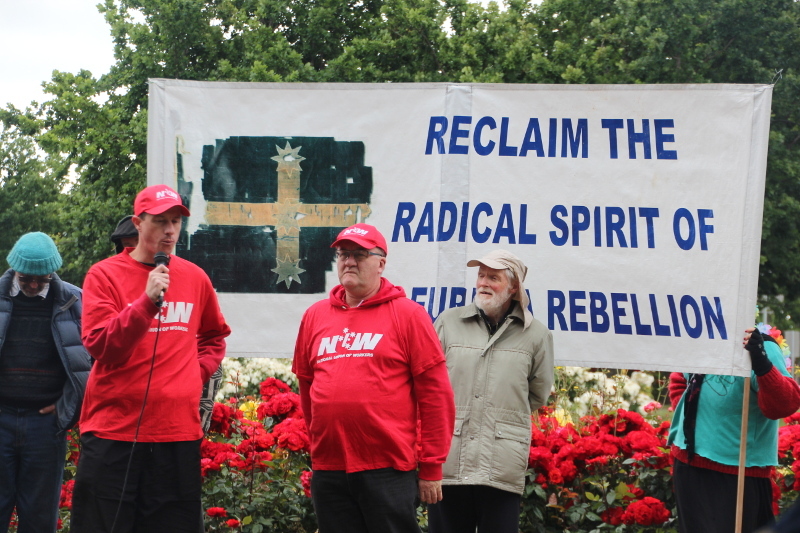 Reclaim the Radical Spirit of the Eureka Rebellion was born. I have participated since 2002, although missed the event in 2015 and 2016 due to attending United Nations Climate Change Conferences in Paris, then Marrakech. Attending Eureka has become entwined in my life. I have a picture of my two year daughter with a friend on the Stockade monument from 2002. When she was eight she used to keep pace with the march on a scooter. I missed the Dawn Vigil this year due to storm damage and flooding in my house. I drove up that morning to attend the award ceremony at Bakery Hill. My former partner, Helen Lee, had died on 13th September 2017, but she had been nominated for a Eureka Australia Medal, and new before her death of the award. Rachel, her partner, and I accepted the award posthumously at Bakery Hill. Helen Lee had often accompanied me to Reclaim the Radical Spirit of the Eureka Rebellion events from 2002. She died within months of the death of Ellen Jose who was an important initiator of this commemorative event. Vale to the strong women activists who were active in this event. In the Courier’s article by David Jeans, Anarchists kick off Eureka 160th anniversary ceremonies, it quotes Dunstan that the effigy burning was to bring fire back into the commemoration, “On the morning of the stockade, there was the smoke of gunpowder, smoke of the diggers fires,” but there is no explanation of why Duncan Lewis was chosen as this year’s “greatest oppressor of Australian rights and liberties”. But the article doesn’t explain why Duncan Lewis was chosen. 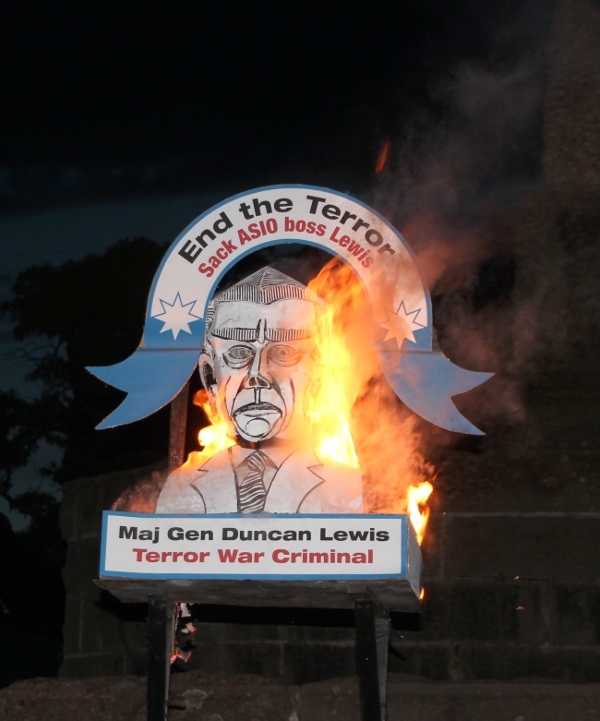 For this you need to have read Dunstan’s media release or heard Dunstan’s explanation at the effigy burning. I captured this on video, with a transcription below. So I say this man who has lied to Australian people about weapons of mass destruction has set us up for permanent war, including Iraq invasion 3, another 200 Special Air Service troops deployed. This is the man who is the most danger to our rights and liberties in this time. This is based on his record, and the new powers he has been given recently. Any Special Intelligence Operation becomes secret which means that all the fighting that goes on overseas has become secret.